Our first ever AIP Approved Snack! Meet our brand new pasture raised turkey sticks! We can't wait for you to try them! Would you take antibiotics if you didn’t have an infection? Of course not, right? But if you’re eating conventionally raised turkey, that’s exactly what you’re doing. While you may not have a prescription bottle in your medicine cabinet, you just might have some deli meat, turkey jerky or hot dogs in your fridge. Are you looking for a way to turn back the clock (or age as gracefully as possible)? Are you looking for the PERFECT snack bar? One that will not only help you feel full, but NOURISHED and ENERGIZED? If so, today’s your lucky day. When Halloween rolls around you don't have to sit on the sidelines when it comes to eating delicious and tasty treats. Here are 7 Paleo recipes that will give your sweet tooth exactly what it needs without sacrificing your health during the holiday season. Did you know that eating the right type of beef can do wonders for your health? Despite what you may have been told about beef, there is actually a plethora of new research suggesting that one type of beef is extremely beneficial. That type of beef is grass-fed beef. Grass-fed beef is very different than its far more common counterpart, grain-fed beef. Understanding this distinction is vital to achieving optimal health. 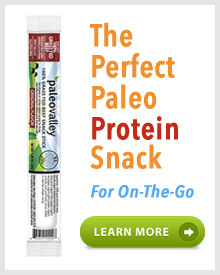 11 Delicious Snack Tips for Paleo On-The-Go! Are there days where you feel too busy to keep up with the paleo lifestyle? Here are 11 simple to follow tips for Paleo snacking-on-the-go to make sure you get the nutrients you need to keep you energetic throughout the day.